Brick walls always portray a classic and elegant beauty. Beyond its aesthetic value bricks increase the market value of your home and make it energy efficient by keeping the interior cool in the summer and warm in the winter. Brick is a very durable material that can resist pests, fire and extreme weather. Brick is one of the oldest construction material that is still used in modern homes. You may have thought about modifying the look of your brick wall or adding a protective layer but are not sure how to go about or if it would be wise to do so at all. One way would be to paint over the brick surface with your desired paint color. While this gives you more colour options to choose from the process isn’t that simple. Another option is to stain the brick. This preserves the natural look of the brick while ensuring it is protected from environmental factors. Brick has to be thoroughly cleaned for the paint to stick. This requires a rigorous brushing and application of trisodium phosphate, or if there is existing paint it will need to be sandblasted. Apply a stain-blocking oil-based primer that can help protect from dirt and soot especially if you have a brick fireplace. Cover the entire brick area with primer while following the paint manufacturer’s instructions. Once the primer is dry apply at least 2 coats of exterior paint for an outside wall or indoor latex for a fireplace and indoor walls. Since the brick surface is most likely not smooth use only rollers that are meant for textured surfaces. Painting allows you to protect the brick surface. Additionally, you can play with colours that are not naturally available with bare bricks. However, once you start to paint on your brick walls you will have to repaint at least every five years. The challenging part is having to remove it later on even with the use of chemicals paint won’t completely peel off. Furthermore, because of the thickness of the brick, moisture may be present internally that could prevent the paint from sticking. After having the brick painted moisture entering from the unpainted side is blocked by the painted side and may cause the paint to peel off. 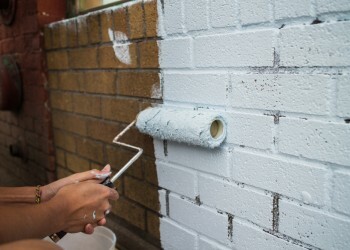 It is recommended to use porous paint for exterior bricks. Clean the surface first to get rid of mildew and dirt by using mild detergent. Use a water-based stain for general use because it is easy to apply and allow the brick to breathe and prevent water build up. Stains with sealant have a water tight effect on bricks causing moisture and water to build up and cause damage. Use this in minor areas only or for very porous, damaged bricks. Stain is the best option to maintain the natural classic elegance of bricks while providing surface protection. However, it is not always applicable to all brick surfaces. Some type of bricks cannot be stained, therefore painting is the only option. You can determine this by splashing a small cup of water on the brick and if water runs off without being absorbed it may have a coat of sealant. Remove sealant by using lacquer thinner or commercial brick or concrete sealer stripper. Test the thinner or stripper on a small area first. If the sealant still cannot be removed, then the brick can only be covered with paint.